Please note: Today we worshiped in the Sanctuary/multi-purpose room of the Hillel House, the Jewish Campus Ministry center, for Washington and Lee University (see previous post) . If you are unfamiliar about synagogues, the center of a synagogue is the bema (the place for the Torah Scrolls) and behind it the niche for the Scrolls. The Hillel House is quite new and contemporary and the Torah niche is locked behind large wood sliding doors. To my pleasant surprise, the doors were unlocked. During the Sermon I opened up the niche at the point indicated in the sermon. Third set: The Son is transfigured, and then soon the cloud “overshadows” them all. As when Mary asked the angel Gabriel, How can she conceive, “And the angel answered her, “The Holy Spirit will come upon you, and the power of the Most High will overshadow you; therefore the child to be born will be called holy—the Son of God.” The overshadowing cloud is the sign of the Holy Spirit and then the Father speaks, This is My Beloved Son. The third set of threes is the Father, Son and Holy Spirit, three yet the one God and Lord of us all. Why did the Lord select Peter, James and John from the twelve disciples? This happened on more than one occasion, for instance, He took them apart when He prayed in the Garden of Gethsemane when the Lord was sorely distressed. Yet, on both occasions, Peter, James and John fell asleep. Asleep during the glory they wanted so much. In the previous chapter from Matthew, Peter confessed Jesus is the Christ, the Son of the living God. Upon this confession, Jesus said, I will build My Church. Sounds glorious, doesn’t? To build His Church, He said He would be arrested, beaten, crucified, cast out and on the third day rise again. Not so glorious and so Peter basically said, God forbid. Peter wanted glory without the Cross, that is, the full pardon of sinners in the necessary judgment of sinners which Jesus bore fully in His sinless body and soul. Luke tells us Peter and company fell asleep during the Transfiguration, overwhelmed by the light, not able to take it in. James and John make the request of Jesus to sit on His left hand and His right hand…Jesus told them it wasn’t for Him to give but to those so appointed, in a sense Jesus was telling James and John they could not take in such glory. The Old Adam cannot take in earthly glory. When in ancient Rome, after a military victory, there would be a great parade of the soldiers, exotic animals taken in the conquest, musicians and dancers to honor the conquering Roman General and then a slave would whisper in the general’s ear: “All glory is fleeting”. “Sic transit Gloria mundi”, thus passes the glory of the world. The Romans got some things right but they said it with nostalgia for a glory that would persist and endure but they could not grab with all their military might and cultural glory. We see day in and day out, famous people at the pinnacle of achievement and power, acting to the world as if the glory would last forever and we think so as well, then stupendously fall. Proverbs 16: 18: “Pride goes before destruction, and a haughty spirit before a fall.” We will hear next week in the Gospel for the 1st Sunday in Lent, the devil tempting Jesus three times and the two times, devil takes Him, where? The heights. First to the pinnacle of the Temple then it is to a high mountain and then shows him all the kingdoms of the world, “…and their glory”. We do not win in the Faustian bargain. We cannot be safe in the devil’s dealing on our own. Now most of us do not have to concern ourselves with such, but we do hanker after it…like at a gas station, a dollar and a dream in a lottery ticket. The Old Adam cannot take in temporal earthly glory in our depravity and so eternal glory? Hardly. When the three disciples hear the Voice, then they fall down in terror, and Jesus touches them and they see Jesus only. He goes to Jerusalem. No man nor woman can grab and hold on to glory, but the glory of the Word made flesh holds them and His hand is strong to save. He is love’s pure light, His love to give and forgive in His hands. So it was to the first set of three that the Lord showed His glory. This is the main reason He took them with Him to the “high mountain apart”; and then, at the end, before Good Friday, He showed them His suffering of soul in Gethsemane: they may know that the One who goes to the Cross is fully God as He is fully man and a man, so we fully know in faith. Peter wanted to build three tents for the second set of threes, equally built. Maybe another reason Jesus took the first set of three is this: they were quick learners but like many quick learners, they can also get the lesson quickly wrong, as Peter did wanting to build those three tents. In the midst of the glory of uncreated light, Peter butts in, he asserts himself when he should have been listening. Not a shred of modesty and humility. Peter is very careful in his speech: a tent, one for you, one for Moses and one for Elijah, implying Jesus is an equal with Moses and Elijah. Peter got that wrong. Jesus is Moses’ and Elijah’s Lord. Now in this place, to even say Jesus is equal to Moses and Elijah might be hotly contested, let alone He is the God of Elijah and Moses. Elijah and Moses were talking with Him. Luke tells us the content of their holy conversation: it was about Jesus’ departure, literally His exodus. Jesus does not insist on some bragging rights over against Moses and Elijah which would be sinful. He wants us to know that all of that which the Lord inspired Moses and Elijah to write and to speak is to point us to the Lord. Joseph Smith and Mohammed, both heretics, rewrote the Bible, Jesus did not, He could not, for He know whom He inspired and knew what He needed for us to hear: the Law and the Prophets. These Words, in the these Scrolls, the first five books of Moses. He did not rewrite the Bible, He fulfilled it for us all, and He is clear that the Old Testament is God’s unaltered Word. The Lord who called Moses and Elijah, not because they were great, but to show them His Word and now the Lord’s Word shines upon them as it did so many years ago. Still does. In many and various ways God spoke to His people old by the prophets but now in these last days he has spoken by His Son. 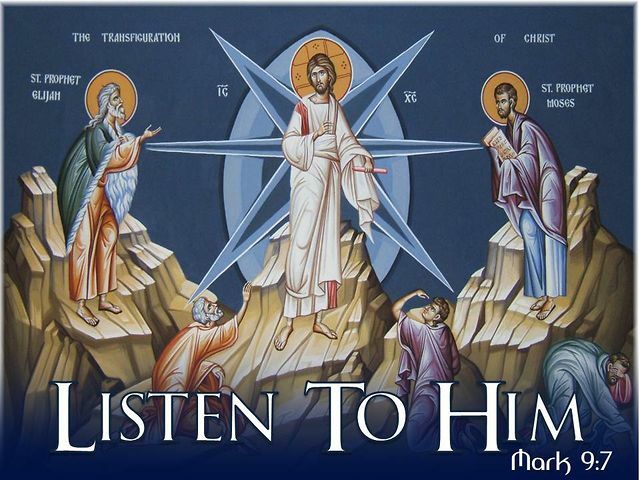 The Son is transfigured, the Holy Spirit descends in the cloud of light and the Father speaks. Epiphany begins with Jesus’ baptism. As the Son came up out of the water, the Holy Spirit descended as a dove and the voice spake: Thou are my beloved Son with whom I am well pleased, the exact words the Father said of His Son in His Transfiguration but now He adds, Listen to Him. The Father does not merely say, my Son, but my beloved Son: for in the Lord, the Father loves the Son and that holy love pours forth in the Holy Spirit. “…God’s love has been poured into our hearts through the Holy Spirit who has been given to us.6 For while we were still weak, at the right time Christ died for the ungodly. Peter, James and John fell in terror, not at Jesus transfigured, not at the bright cloud but at the Word of God, yet it is the Word of such holy love…maybe that’s why they were sore afraid. On another occasion when the Lord filled his fishing boats with so many fish the boats began to sink under the weight of so much goodness, Peter fell down before Him and said, Depart, from me O Lord for I am a sinful man. Sinful man can not gaze into the unmasked utter goodness and mercy of the living God without terror at their own wretchedness. The Father says to them and to us all, Listen to Him. We will hear next week, again Lent 1, tell the devil, Man does not live by bread alone but by every word that proceeds from the mouth of God, quoting the Bible, specifically Deuteronomy. We listen and hear every Word from God in the Bible and from the Word made flesh. The love of God in Jesus Christ, literally touched them, Rise and fear not, Peter, James and John, I have loved you from before the foundations of the world and I will go down to die and then to rise. The first set of three is you and me. The second set of three, the Church, in which we are made part of, His Body by our baptism into the Holy set of Three, In the Name of the Father, and of the +Son and of the Holy Spirit. Amen. The Lessons for the 25th Sunday after Pentecost, Year C, can be found here. The Sadducees thought only the first five books of Moses, the Torah, Genesis through Deuteronomy were really the inspired Word of God, but not the remainder of the Bible. Since the Torah does not mention resurrection, they said there is no resurrection. The church of the world bends the Word of God to its own fancies. The Sadducees robbed themselves of such sweet comfort the Lord gives to men and women: the hope of the life of the world to come. By their false doctrine or teaching, they robbed others as well of consolation, the Lord’s own Word. Maybe to make Biblical teaching more palatable and more in tune with people’s need. Maybe to control them. Maybe they had a hard time understanding the resurrection of the body. I do. However, when Jesus says to Martha at Lazarus’ tomb, I am the resurrection and the life, that there is no death, the stench of sin and trespass in Him, I get it but more He has me, not as His plaything to use us, but as baptized sons and daughters to love you all. By His Word Lazarus comes forth. He is the Lord and by His Word saves, utterly out of the control of the Sadducees, the Pharisees and all false teachers. His Word is not chained. It is not bound. Therefore, the church of the world comes with trick questions to the Church of the Word as it did to Jesus. The Sadducees brought up levirate marriage. “Levir” is Latin for brother’s wife. According to Moses command to Israel in Leviticus, if a man dies childless then his wife marries his brother. The Lord provided social security to Israel. This is God’s good for Israel, but in a religious argument, men twist God’s Word. What happens if this happens 7 times, since there were 7 brothers and each brother died childless: Who’s wife shall the woman be in the resurrection? The life to come will be the new creation. It will be qualitatively different. In the resurrection men will not marry nor be given in marriage. As the Lord said in Hosea, the land will be called, “married”, the whole land, the whole of God’s people, His Church is the bride of Christ and for her life He died. Those who are deemed worthy, of worth, deemed worthy by someone else, the Lord: by His grace for us all, to His sons and daughters, sons and daughters of the resurrection. Jesus quotes today’s Old Testament lesson: I am the God of Abraham, Isaac and Jacob. Present tense God, I am, for present tense people, whom I saved. The blessed patriarchs are before the Lord who made them His own and He does not give up on them in death, neither you. Moses was standing on holy ground and so were the Saduccees but they did not know it. Moses saw the bush on fire but not consumed, such is the work of the Holy Spirit. On fire, the dross of sin melted away but the branches alive in Christ’s forgiveness. The Lord, said Jesus, His Father, is not the God of the dead, of sin, but of the living, for all live to Him and through His Son, by faith, makes all alive. He is the present-tense Savior for present tense sinners. Jesus ended the argument with the truth of Biblical doctrine or teaching. They could not ask him another question. I think Jesus would have been a real kill-joy on a blog. No endless thread of discussion, for He weaves our the threads of our lives into His life, the life of all the living, the death of death our foe. The Church of the world is unsettling, as the Apostle Paul knew. The Church in Thessalonica had heard false doctrine. “… not to be quickly shaken in mind or alarmed, either by a spirit or spoken word, or a letter seeming to be from us, to the effect that the day of the Lord has come.” As for the Lord, so for His Church: the Thessalonians concern was the resurrection caused by false teaching. First, before the day of the Lord the “lawless one” is to be revealed, that is, the antichrist. The lawless one has not been revealed because the day of the Lord has not come, yet, lawlessness is all over and building. The man of lawlessness is at work but the Lord is restraining him. Disregarding the Law of God when it comes to the 5th commandment, you shall not kill, and allowing for abortion. Disregarding the 8th commandment about not bearing false witness and lying has been institutionalized in our politics, or worse, the churchly institutional lying about what the Bible says. Disregarding the Law of God as to the 4th and 6th commandments and the biological and spiritual marriage between man and woman is denied, and marriage, and the abuse of women and abuse of the family. Disregarding the regular abuse of the 2nd commandment, regarding God’s Name and its regular abuse and the attendant demons of foul language. …the 1st commandment. Lawless ones become their own law and are worshiped: from politicians to singers to athletes etc. etc. etc. The gods of the church of the world, the golden calves, are to be seen and demand sacrifice for their policies and programs. (The lawless one) acts as though he were not under, but over God’s will and Law; he treads all true religion under his feet, making the service of God a play and a farce. So Pr. and Prof. Paul Kretzman, Missouri Synod wrote in his commentary on the Bible in the ‘20s, on the Epistle reading. Back then radio preachers were the media evangelists who in the hands of Billy Sunday and Aimee Semple MacPherson made the true religion into a play and a farce. Look how many times the service of God is made into a play and farce on television these days. The problem is not too little religion but too much religion, that is, false religion and the idolatry of lawlessness. These false gods demand sacrifice as much as Israel willingly gave up all their gold and silver and gems to make the golden calf. As lawless as the day of the Judges and the last verse of the book of Judges, Everyone did that which was right in their own eyes, for their was no King in Israel. Beloved! The King lives in His Israel, His kingdom, His reign, not of this world. The Lord calls and makes His Church by and through His Word, the Word made flesh. Church of the Word is called to hear. Now may our Lord Jesus Christ himself, and God our Father, who loved us and gave us eternal comfort and good hope through grace, 17 comfort your hearts and establish them in every good work and word.